How fortunate we are to have two books published for the Friends in one year, telling us about the people who lived in Holland House (The Families of Holland House by Carolyn Starren) but also the history of the House’s surrounding land and gardens (The Pleasure Grounds of Holland House by Sally Miller). They are both beautifully produced, with many delightful illustrations, and complement each other perfectly. On 24 October Sally Miller gave a fascinating talk about the pleasure grounds of the House, illustrated with wonderful old photos, plans and maps, which she had discovered during her painstaking research for the book. It is amazing to think that the estate once stretched from what is now Holland Park Avenue almost to the Thames, and in the west to as far as where the railway line is that runs through Kensington Olympia Station. If one knows Holland Park well it is great fun to find the traces of how the grounds were laid out and altered over 400 years. Did you know, for instance, that the arches to the north of the Belvedere Restaurant are all that is left of the original stable block built in grand style by Sir Henry Rich around 1638 at a cost of £4,000. They were the arches of the coach house. When the present stable block was built in 1812 it was decided not to demolish the arches of the old one because the impression they gave of a ruined aqueduct was thought attractive, and for many years they were clad in ivy; and who would have known that the alcove known as Rogers’ Seat (named after a Samuel Rogers), immediately to the north of the arches, was the fireplace of the coach house’s wash house. We also heard that the Napoleon Garden facing Rogers’ Seat, where dahlias are now crowding around a sculpture, was so named because the 3rd Lord Holland and his wife were admirers of Napoleon and had a bust of him placed on a marble pillar there. Sally Miller left until last her telling us of her ‘bingo moment’. This was when she was perusing the 1694/5 survey map of the estate. She noticed an unusual pattern and rightly suspected that it was a water maze. Sir Walter Cope, who had built Holland House (then ‘Cope’s Castle’) 90 years earlier, had been well acquainted with William Cecil, Lord Burghley, who owned Theobolds in Hertfordshire with its beautiful Elizabethan grounds complete with a water garden. Perhaps this had inspired Sir Walter’s maze of ponds, gravel walks, islands and bridges. Reading about such features in greater detail is a delight awaiting you. Chess players like to contemplate their next move, and sitting down seems to help. 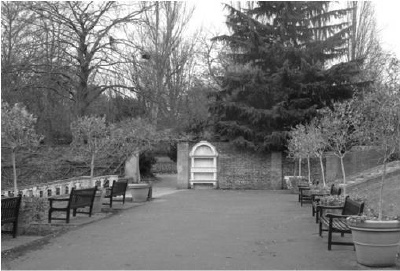 Until recently seating had only been provided for observers of games on the giant outdoor chessboard just west of the Dutch Garden, so the Friends of Holland Park have donated two matching benches for the players. The attractive benches are each robustly constructed in sandstone, with a grey limestone seat. The Friends hope these seats will aid contemplation. Not all readers might have been aware that Holland Park was first opened to the public in 1952, the year of the Queen’s accession. It therefore followed that 2012 was the Diamond Jubilee for both the Queen and the Park, and the two events were celebrated jointly with a party given by the Borough on 29 June. The path between the Mediterranean bed and the rest of the formal garden was christened the Diamond Jubilee Walk. 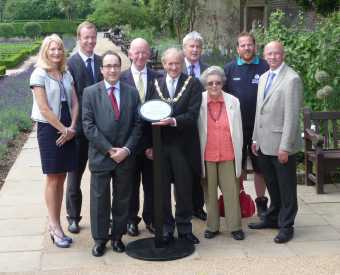 Among those present were Cllrs Lyn Carpenter, Nick Paget-Brown, Sir Merrick Cockell and Christopher Buckmaster (Mayor); Senior Contract Manager of Quadron Ben Binnell, MD of Quadron Clive Ivil, Head Gardener Ian Fleming, Park Manager Barrie Maclaurin and Rhoddy Wood. Also there was a ceremony in which each member of the Parks Police was presented with the Queen’s Diamond Jubilee Medal. This has been an exceptionally busy season for the police with the visit by the Emperor of Japan, the Jubilee, the Olympic Torch Relay, and 24-hour coverage during the Olympics to prevent unlawful campers. Leave had to be cancelled and extra shifts worked. It was good to be able to applaud the police for their continuing energy and diligence in keeping Holland Park and the other parks of Kensington and Chelsea secure and happy places to relax. This is to remind you that Christmas is almost upon us and if you have not already stocked up with cards, it is time to do so. All readers got a brochure with the last newsletter which gave them illustrations of the Mountbatten cards with views from all over London. If you have lost yours and want another copy, please ask. 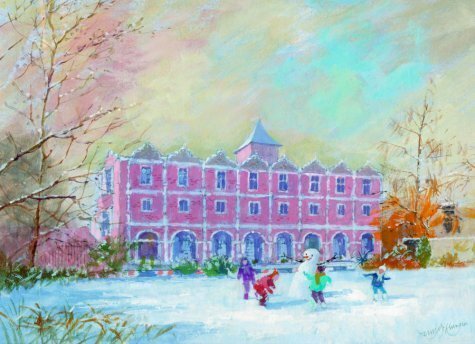 Meanwhile, pictures of some of our own Holland Park cards are shown under 'Christmas Cards', including this year’s new full-sized one of Holland House from the West at 75p. It clearly shows the area now open to the public out of the opera season due to ten years’ work by the Friends. Other available cards include two smaller ones: of the Stable Yard, which is exceptionally pretty, and the East Wing of Holland House, both at 55p. Bargain seekers go for packs of 10 mixed old designs in mixed sizes at £5.00. If you send your order to 21 Kenton Court, the minimum order is 10 cards and we will deliver free within our newsletter hand-delivery area but have to charge £1.40 postage per ten beyond that. If you order from Mountbatten cards directly, delivery is free to most West and Central London postcodes but is £5 if outside that area or the order is for less than £30. Overprinted cards must be ordered from Mountbatten. In either case envelopes are included and there are discounts of 5% on 100 cards, 10% on 200 and 15% on 300. We hope that you will all nominate FHP as the recipient of the charity donation from Mountbatten of 25% of the profits but you are free to choose any charity. Our second new book this year has just been published. 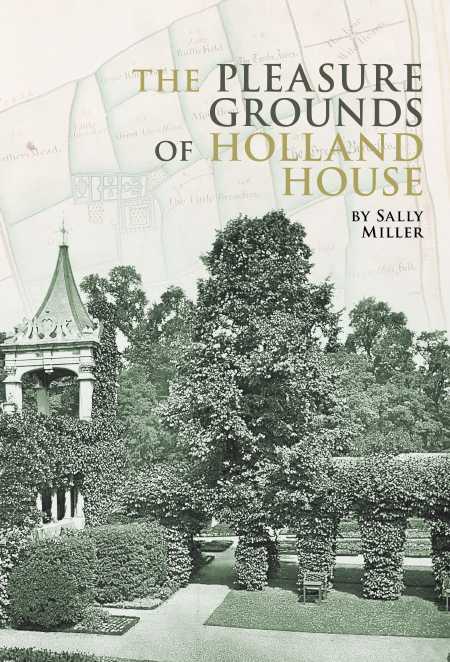 The Pleasure Grounds of Holland House commissioned by The Friends and researched and written by Sally Miller as a companion to The Families of Holland House published earlier this year is now available. Full details may be found under Merchandise. Crab Apple Jelly Jeremiahs have been telling your secretary how none of their favourite apple trees are bearing fruit this year. If this dearth does indeed extend to crab apples, then there can be no jelly. Nevertheless, she will check all her favourite trees in early October and you are invited to ring her on 020 7602 0304 from 8 October to discover the position. Winter Warmer Talk. 6.30pm Thursday 21 February in The Orangery. During the late 18th and early 19th century Holland House was a magnet for the powerful, intelligent and fashionable of UK and Europe. Henry Fox, third Baron Holland, had assured connections with the Whig party through his uncle, Charles James Fox. Henry and his wife Elizabeth were indefatigable travellers, making contacts that brought all shades of European thinking to their dinner table. This potent mix influenced the careers of everyone who came within its orbit. A dinner party in Holland House was both serious and amusing, but also a challenging experience where snobbery was raised to an art form, risked by guests because it was easily one of the most exciting places in London. The wit was a draw and so perhaps was the scandal, the Holland family always being a ready source of material for the scandalmonger. Our speaker, Dr Leslie Mitchell, has researched and written about the Holland House set and the social and political context in which it operated. His books include Holland House and Charles James Fox and his resources have not only provided many fascinating facts but also engaging anecdotes about the characters and their often eccentric behaviour. Dr Mitchell is Emeritus Fellow in Modern History at Oxford. Tickets at £12, including wine and Janice Miles’ delicious canapés, may be obtained by adding the event to this order form. It is only weeks since I was appointed Chairman, and my e-mail box has never been fuller: so many activities undertaken by the Friends to be monitored, and many I am now actively engaged in. I have chaired my first committee meeting, been introduced to and received encouragement from Borough councillors, and attended Sally Miller’s illustrated talk and book launch in the Orangery, where I met many members and received a most warm welcome. I do not think I have ever met a more enthusiastic membership in any organisation I have been involved in. The highlight last week was to be given a guided tour of the gardens with Rhoddy Wood and Barrie Maclaurin, the Parks Manager for the Borough. It was drizzling hard but, with no one in the park, it was very quiet and peaceful, and I felt very much as if I owned the whole park myself. Barrie is brilliant: he knows absolutely everything about it and shared with us what improvements are being made and proposed, and showed me areas of the park which are secret and which will definitely be part of a fuller report later. I cannot finish without giving a heartfelt thank you to Rhoddy. She knows absolutely everything about the Friends, and is giving me valuable insights into being as good a chairman as I can be. I look forward to working with the committee and meeting many more Friends in the future. Finally, I wish to give you all plenty of advance notice of the next Annual General Meeting, which will be held on Wednesday, 20 March at 7.30pm in the Orangery. This is for those of you who like getting your hands dirty gardening, but have little or no opportunity to do so. The Park welcomes all the help it can get whether with light jobs like dead heading or hand weeding or heavier work like uprooting brambles in inappropriate places. In the first instance, do contact Rhoddy Wood if you would like to discuss the possibilities with her. She will put you in touch with the Head Gardener, who will arrange a half hour appointment with you to satisfy Health & Safety requirements. This means a little paperwork and instruction in safe procedures. After that, a name tag and notebook will be put in a box for you in Park Reception and when you want to garden all you have to do is to sign in. With the box is always a general list of jobs wanting doing and some basic tools. For the stronger ones of you, there are occasional opportunities to help park staff teams with bedding out or clearing, but you do have to book ahead for these. We are looking forward to our popular annual carol concert given by the Tallis Chamber Choir and their conductor, Philip Simms. There will be a wide selection of carols from the 16th century to the present day ranging from the sublimely beautiful to the light-hearted, and sung in several languages including Latin and Russian. The carols will be interspersed with a special selection of seasonal readings. Afterwards we will enjoy wine and Janice Miles’ renowned canapés. Please book using the order form. We are delighted to report that after a long search the trustees have invited Stewart Katz to succeed Nicholas Hopkins, who stood down from the chairmanship at the AGM in March. Happily, Stewart has accepted and is keen to start work. He will be co-opted formally at the trustees’ meeting in October and will then stand for election at the AGM next year. Stewart Katz, a chartered accountant whose current practice is in Notting Hill Gate, has been in various partnerships over the years and managing partner of a 30-employee practice. In that capacity he has had to deal with hundreds of clients from all backgrounds, and has thoroughly enjoyed the challenge presented, which will hold him in good stead in his new role. He is also a trustee of the charity Children in Need (not the BBC one) and an adviser to Kids in Museums, as well as a patron to The Kensington Forum for Older Citizens. In any spare time Stewart is interested in observing nature, reading science, collecting minerals and playing table tennis. Last summer our Pimm’s party was rained on, and so it was on the evening of 18 July this year, except somewhat more decidedly. Once again Park management and hostel manager Sally Martyn-Johns came to the rescue with gazebos under which we all cosily congregated in the youth hostel garden, in true British spirit not at all fazed by something as trivial as the weather. Once again we were forced to stand closer to our fellow guests than we might otherwise have done, which can only be a good thing; these included Mayor Cllr Christopher Buckmaster with Mayoress Mrs Anne Hobson, Cllrs Deborah Collinson, Johanna Gardner, Tony Holt and Warwick Lightfoot. Trustees had rolled up their sleeves and prepared the jugs of Pimm’s. Our regular caterer and Friend, Janice Miles, was on holiday, so we were most grateful to Jidwiji Nasarzewska (‘Jackie’) for providing delicious refreshments. Thanks are also due to Sally Martyn-Johns for her kind hospitality. Sadly, Terry McGrivigan, who painted our Christmas cards for a number of years, died a few months ago. However Mountbatten Cards found Catherine Masterman to continue the tradition, and she has produced our new card for 2012. It is called Holland House from the West and shows the front as it was last winter with the benches given by the Friends and the topiary to furnish it while the public is allowed in. Opening this area when the opera is not there is an achievement of which we are very proud. 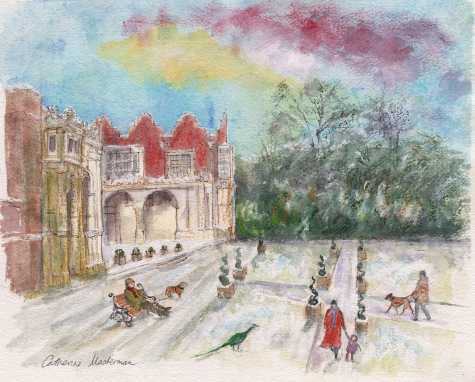 We will also be holding stocks of some previous cards: the full-size Alcove and Dutch Garden at 75p, the smaller East Wing, Holland House at 55p, and packs of mixed designs and sizes at £5 for 10. 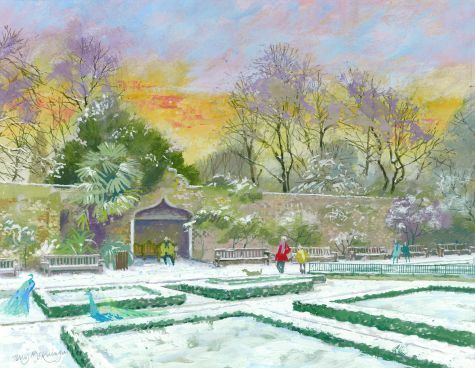 There are other Holland Park designs as well as a large variety of London views in the brochure, and an even wider selection on the website www.mbcards.co.uk. If you send your order to 21 Kenton Court, the minimum order is 10 cards, and we will deliver free within our newsletter hand-delivery area but have to charge £1.40 postage per 10 beyond that. If you order from Mountbatten Cards directly, delivery is free to most west and central London postcodes but is £5 if outside that area or the order is for less than £30. Overprinted cards must be ordered from Mountbatten. In either case envelopes are included and there are discounts of 5% on 100 cards, 10% on 200 and 15% on 300. We hope that you will all nominate FHP as the recipient of the charity donation from Mountbatten of 25% of the profits, but you are free to choose any charity. Events organised by the Ecology Service of RBK&C are listed as ‘ES’, some of which are sponsored by FHP where indicated. Unless otherwise stated the meeting place is outside the Ecology Centre in the stable yard. Some must be booked, in which case please call 020 7938 8186 or e-mail ecology.centre@rbkc.gov.uk. There is a charge for those marked £. The Holland Park Conservation Volunteers sessions are on every third Saturday of the month. For more information call 020 8743 3040 or visit www.groundwork.org.uk/london. 7.30pm in the Orangery, £17. The Tallis Chamber Choir is greatly looking forward to singing for the Friends in the Orangery in Holland Park at 7.30pm on Sunday, 9 December. This annual concert presaging Christmas will, as usual, include an eclectic mixture of ancient and modern, plus one or two surprises. This enjoyable event is always well subscribed, so do book your tickets in good time. These are £17, to include wine and canapés; they can be ordered on the order form. Our autumn event is an illustrated talk by Sally Miller to mark the publication of her book which was commissioned by The Friends, The Pleasure Grounds of Holland House. Little has been written about the park and pleasure grounds, but Sally has discovered records to show that they were laid out by successive owners with taste as well as money, and who were familiar with some of the finest gardens in England. Changing landscape fashions down the centuries were reflected in the gardens of Holland House. The original estate, created in 1591, covered about 500 acres from what is now Holland Park Avenue almost to the Thames. 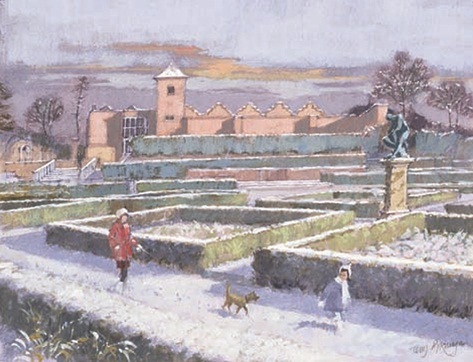 Sally’s book uses the surviving evidence to create impressions of the gardens as they would have been seen and experienced in each of the four centuries of their existence. After her retirement Sally Miller gained an MA in garden history from Birkbeck College, University of London, and is now a professional garden historian researching, writing and lecturing on garden and landscape history. Having moved from London to Winchester, she contributes both to the work of the Hampshire Gardens Trust and the London Parks and Gardens Trust where she coordinates a group of volunteers who research material for www.londongardensonline.org.uk, a comprehensive database of the public parks, gardens, squares, historic greens and commons, cemeteries and churchyards of local historic interest in Greater London. She has previously published The History of Bishops Park and articles in Garden History and the London Gardener. Sally has family connections to Notting Hill dating from the 1940s, and she lived there briefly in the 1970s, so Holland Park was a favourite place, and she has enjoyed the opportunity to explore its history. Tickets, priced at £12, may be obtained using the order form. The price includes wine sourced from the Belvedere Restaurant and delicious canapés by Janice Miles; and, of course, copies of Sally’s book, hot off the press, will be available to purchase at just £9.99, signed by the author at no extra charge! As part of ‘Taskforce 4 Nature 2012’ the Ecology Service started the ‘Holland Park Conservation Volunteers’ programme in February. Sessions are on every third Saturday of the month. For more information call 020 8743 3040 or visit www.groundwork.org.uk/london. There was a very good audience in the Orangery on 31 March to hear an interesting programme performed by the Russian Virtuosi, led by our old friend Natalia Lomeiko, this time without her husband Yuri Zhislin, but joined by her sister, Alexandra, and a Belorussian viola player, Ekaterina Lazareva. The works were Czech, Hungarian and Russian and in many cases much influenced by folk music. We started with Dvorak’s Terzetto for two violins and viola, Op.74, written in 1887 to be played by a student amateur violinist, who was lodging in Dvorak’s house, the student’s violin teacher and Dvorak himself, who played the viola, but the piece proved too difficult for them. There followed Prokofiev’s Sonata in C for two violins, Op.56, written in 1932 whilst on holiday in Ste Maxime. The four movements were described by Prokofiev’s son, Sviatoslav, as ‘lyrical, playful, fantastic and violent in turn’. After the interval we had three of the 24 pieces from Tchaikovsky’s Children’s Album, originally written for the piano in 1878, but arranged for two violins by Lev Tchistiakov. We finished with Kodaly’s Serenade for two violins and viola, Op.12 written in 1919-20. The piece shows strong influences of folk music. As usual the quality of the performance was outstanding and we are very fortunate that such brilliant musicians wish to come and play for us. At the beginning of the second half Natalia briefly addressed the audience, saying how much the players enjoyed performing in the Orangery, and hoped to return next year. We much look forward to it. This was the title of the talk given in the Orangery for our Winter Warmer by Dr Jill Raggett who is Reader in Garden and Designed Landscapes, and Manager of the Centre for Arts and Design in the Environment at Writtle College, Chelmsford. We are sorry that for copyright reasons we are not able to reproduce any of the charming illustrations she showed us. Between 1600 and 1853 Japan had been closed to all foreigners except the Dutch who were allowed to trade from one small island off Nagasaki. Two great plant collectors, Siebold and Thunberg, operated from the island. So there was little knowledge but great curiosity in the West about that country. From 1853, as a result of American gunboat diplomacy, Japan started to be opened up. The first people to be allowed onto the mainland were diplomats travelling to the court at Edo, and they could only see what was en route and at Edo. What they then saw they took to be typical although there might be nowhere else like it. So at Nikko the first garden to be seen had a steeply-arched bridge painted red and this was soon being reproduced in England under the mistaken impression that all Japanese gardens had similar ones. Gradually, the diplomats were supplemented by yatoi, western experts who came to live and teach in Japan. Two of these, Morse and Conder, wrote hugely influential books describing what gardens they had seen. Plants considered to be typical included lilies, bamboos, acers, wisteria, irises and Pampas grass (the origin of our clumps?). Other features portrayed by them were rocks, Nara stone lanterns, tea houses, and bridges, which in pick-and-mix fashion were soon decorating many ‘Japanese’-style gardens in the UK. The popularity of this style was fed by other writers, wives of diplomats and wealthy globetrotters, in the 1890s and the 1900s, and also by exhibitions. These included the Japan-British Exhibition at the White City in 1910 and horticultural shows at Holland House, Temple, Chelsea and Southport. Nurseries specialising in Japanese gardens sprang up. Lord Ilchester created his Japanese Garden in Holland Park which was completed by 1902 and illustrated in Country Life, and soon there were many others – about 200 have been recorded. What none of them had was any understanding of the principles that underpinned Japanese Garden design so, though pleasing to the Western eye, they can seem empty and jarring to the Japanese. We hope and believe that our current Kyoto Garden, designed by two Japanese artists, reflects its Eastern origins more faithfully. As a companion volume to The Families of Holland House, the Friends commissioned Sally Miller, a professional garden historian, to write a history of the gardens and plantings of Holland House from 1600 to World War II. At our autumn event, Sally will talk about the research story behind her book, The Pleasure Grounds at Holland House, to be published shortly by The Friends of Holland Park. The book sets out to use the surviving evidence to create impressions of the gardens as they would have been seen and experienced in each of the four centuries of their existence. It starts with the Jacobean gardens of the early 17th century and ends when the remaining grounds of the house were sold to the London County Council for a public park. Sally spent over a year researching the gardens and will talk about the original documents which helped to piece together the story. Unsurprisingly, there were gaps in the records spanning 350 years, but there were also exciting and unexpected finds along the way. Tickets are £12 to include wine and Janice Miles’ delicious canapés. To ask for your tickets please use the order form . You are invited to help our Youth Hostel to celebrate YHA Day from 10am on Saturday 15 September. This includes the chance to look round the youth hostel - including the East wing of Holland House – have a coffee in their oh-so-private garden or stay for a BBQ lunch. The Friends will also be there with publicity and a limited amount of goods for sale. For more details click here. David Cottingham’s new exhibition in the Ice House Gallery has just one more week to run. Reaction to date has been very positive – don’t miss it! Click here for further details. He is a London-based artist who has developed a large body of work in both the figurative and abstract traditions. His paintings are inspired by landscapes, dancers, cities, spaces, memories and the emotional power of colour and light. Do not forget to book in advance for our summer party. This is our one event of the year which is only open to members and their immediate guests. The youth hostel garden is a unique setting in the park, rarely accessible to the public, and we are indebted to Sally Martyn-Johns, manager of the youth hostel. Please book your tickets at £12 each, to include Pimm’s and light refreshments, on the downloadable order form. For 350 years successive owners of Holland House were at the heart of political, social and literary life in London until the house was bombed during the Second World War. The Cope and Rich families (the Earls of Holland and Warwick) were the owners from 1604 to 1721 and the Fox and Fox-Strangways families (Barons Holland and the Earls of Ilchester) from 1746 to 1952. These influential and interesting figures of London Society and beyond, and their guests, are the cast of Carolyn Starren’s carefully-researched and fascinating account of the life and times of Holland House. The handsome and well illustrated volume of 58 pages (the cover photo of which is on the front of this newsletter) is now available at £5.95 plus £1.10 postage. Please use the order form or buy from the Park Office. We are still urgently seeking a new chairman to replace Nicholas Hopkins, who has taken well deserved retirement from the post while remaining a trustee. Please continue to give this some serious thought, and ask among your friends for a likely candidate. If you have any ides, plase let Nigel Brockmann or Rhoddy Wood know. Please note - position now filled. Every little helps... When Tesco refurbished their store on Holland Park Avenue, they wished to mark the occasion with a donation to a local organisation and their staff nominated the Friends of Holland Park. This picture shows our Secretary, Rhoddy Wood, in the Dutch Garden, receiving a cheque for £250 from Scott Weeks, the representative from Base Build who carried out the construction work. In the north-east corner of the Dutch Garden you might have noticed an elegant stone fountain attached to the brick wall at the right of the gate onto the North Lawn (the gate in the cover photo). 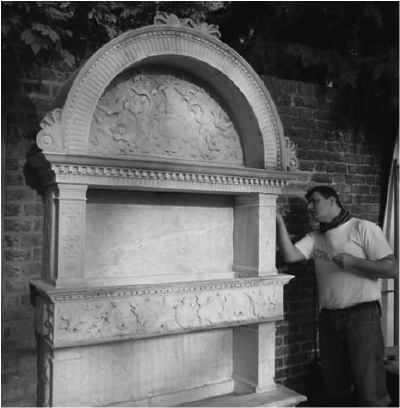 It was in need of much care and attention, and has now been painstakingly conserved by an experienced stone mason, this having been funded by The Friends of Holland Park. No one has been able to trace the origin of the fountain or its precise history in Holland Park but it is known that the floral decoration is typically 19th-century Italian. As stone mason Paul Mills cleaned the Portland stone and marble to bring up the original colours, and replaced a couple of broken corners with matching stone, he reflected on the fountain, and his observations are interesting. He guessed the fountain had been moved from its original position because the stone at the rear sides had not been dressed and would at some point have been inset into a wall. The basin, in its current form, is too narrow to serve any real purpose, and jets from the, now dry, spouts would splash water well beyond the trough. So he wondered if the basin had once been larger and used as a rather superior horse trough. This view is supported by the fact that the stone at the front of the trough is different from the rest and is probably not the original. These two conjectures made us wonder if the back part of the fountain had once been part of the stables at the west end of the Dutch Garden, and had been moved in about 1812 when the stables were demolished and the Dutch Garden created. The newer ‘Italian’ part must have been added after 1812 and would fit with the other Italian garden ornaments that Lord Holland introduced to the formal garden over the following years. Maybe we will be lucky enough to find the fountain, in its original or current form, included in one the photos currently being researched for the Holland Park garden history publication. cast cool shade, In gardens here. This plaque was not part of the original fountain design, so a new home has been found for it nearby, on a low wall at the opposite end of the terrace, next to the steps leading down to the café. As this is a relatively quiet corner Park Manager Barrie Maclaurin intends placing a bench there so visitors can enjoy a new reflective space. At the time of writing he is waiting to find someone who wishes to donate a memorial bench, matching others in the Dutch Garden. Our audience packed the Orangery to listen to the Tallis Chamber Choir, conducted by Philip Simms, on their twelfth visit to entertain us, accompanied in some pieces by Michael Paine on an electronic keyboard. The novelty and variety of programmes which Philip Simms devises are extraordinary, and this year was no exception, ranging from Sicily through Spain, France, the Netherlands and Germany to the UK. As usual, the quality of the singing was of a very high standard. We started with a folk-like song of Sicilian origin, ‘O sanctissima’, arranged by two Americans, Alice Parker (b. 1925), composer, arranger and conductor, and Robert Shaw (1916-99), a well known conductor. They also together arranged a Catalan Christmas carol performed later in the programme. There followed a German carol, ‘Es ist ein Ros entsprungen’, by Michael Praetorius (1571-1621), a slightly younger contemporary of Thomas Tallis, and also of the Dutch composer J.P. Sweelinck. We returned home briefly with a well known English carol, ‘In the bleak mid-winter’, a poem by Christina Rossetti (1830-94) set to music by Harold Darke in 1909 (1888-1976), not to be confused with Gustav Holst’s setting known as ‘Cranham’, published in the 1906 English Hymnal. We returned to Spain with a villancico or Christmas carol (‘Riu, riu, chiu’) by the Catalan composer Mateo Flecha (1481-1553) and then went on to the Netherlands with ‘Hodie Christus natus est’ by Sweelinck. We finished the first half with ‘Il est né le devin enfant’, a French carol based on a 17th-century melody arranged by John Rutter (b. 1945). After a short break, we had a traditional English carol, ‘Lord of the dance’: ‘ Tomorrow shall be my dancing day’, in the arrangement by David Willcocks (b. 1919), one of many arrangements of this carol. We then returned to Spain with a Catalan Christmas carol, ‘Fum, fum, fum’, thought to be 16th or 17th-century in origin, arranged by Alice Parker and Robert Shaw; whilst the literal translation of the Catalan word ‘fum’ is smoke, the relevance of which is obscure, the Oxford Book of carols suggests that ‘fum, fum, fum’ might be imitating the sound of a drum or the strumming of a guitar. There followed a Christmas meditation, very lyrical in feeling, ‘A spotless rose’, composed by Herbert Howells (1892-1983), the text being an anonymous German hymn, probably 16th-century, ‘Es ist ein Ros entsprungen’, the same as that used by Praetorius for the second piece mentioned above. We did not have Philip Simms’s arrangement of ‘White Christmas’ this time, but instead that of ‘Rise up, shepherds’, an American spiritual. Finally we had John Rutter’s ‘The very best time of year’, which seems more like the chorus from a musical than a carol. The audience joined the choir in four traditional carols, and all the carols were interspersed with six readings, five by members of the choir and one by our own Joy Puritz, all relating to Christmas, and three being extracts from Charles Dickens; but perhaps the most moving was a letter from an officer on the front describing the Christmas truce of 1914. Every year I say that Janice Miles excelled herself with the food she produced after the concert; this year it really was the case again and, as usual, the wine flowed freely. We left the Orangery uplifted, having had a really splendid evening and a wonderful introduction to Christmas. 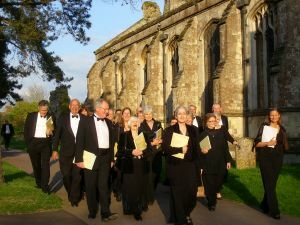 We are, as always, most grateful to Philip Simms and the Tallis Chamber Choir and for providing us with such great entertainment, and we hope that they keep coming back. The annual subscription to The Friends of Holland Park runs from 1 January to 31 December except that new members joining after 1 September in any year are deemed to have paid for the next year. Most members sensibly paid by standing order on 1 January so they do not have to remember, and a good number of others have already paid by cheque. Our sincere thanks to all these. However if, and only if, the order form that came with this newsletter is green, it means that at the time of writing (end of January) we had not yet received your payment. Please make it now to save us having to remind you individually. If anyone has not yet made a standing order and would like to do so, you will find a form on the back of the green sheet. Minimum subscriptions for individuals are £12, or £9 for the over 65s. Two members living at the same address may take out a joint membership for £20, or £15 when both are seniors. Please make your cheques payable to ‘The Friends of Holland Park’ and post to Rhoddy Wood, 21 Kenton Court, 356 Kensington High Street, W14 8NN. Thank you. The position involves the receipt of applications for the exhibition and for the advertising poster competition; production of the poster and catalogue; promotion; liaison with stewards and helpers; oversight of the erection of exhibition panels and display of works; on-site receipt of exhibits and return of unsold work; record keeping and accounting.